This week-end we moved the chickens from their brooder house (our former shed) out to the chicken tractors, on pasture over at Big Bear Ranch, just around the corner from us. The chicken tractors are an amazing innovation, constructed by Rainer and Florian, they are 12 feet x 12 feet and can house up to 100 chickens. They have removable wheels and are moved daily using a dolly. Chicken tractors can be moved frequently, providing the advantages of free ranging with the protection of the enclosure. In a chicken tractor poultry have access to fresh forage, including grass, weeds, and bugs, though these resources will quickly be depleted if the tractor is not moved. This supplements their diet, reducing the amount of feed they consume. Because the enclosures do not have floors there is no need for periodic cleaning out, unlike stationary chicken houses. 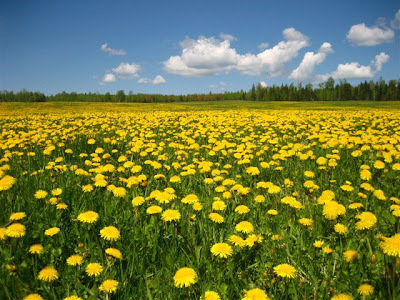 The frequent moves to fresh grass can also avoid a buildup of manure. Chicken tractors imitate a natural, symbiotic cycle of foraging in which the animals eat down the vegetation, deposit fertilizing manure, and then move on to a new area. 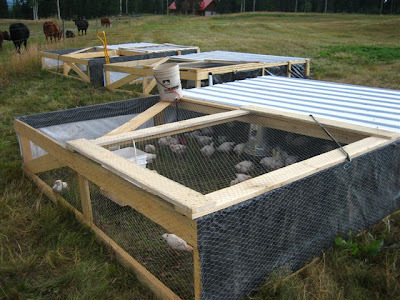 By using chicken tractors, flock owners are able to raise poultry in an extensive environment, where the birds have access to fresh air, sunlight, forage, and exercise, which caged birds in commercial houses do not have. By using one small section of a field at a time, allowing all the other sections to recover, the field can sustain more birds than if they were turned out on the whole field all of the time. Because of this chicken tractors enable people to maximize the use of their land. The enclosures also offer some protection from predators and weather, and in the case of egg producers, the birds lay eggs in designated nest boxes rather than hiding them in foliage. ...yes, this is the 'good life'!